It’s been a series of convergences that now seem like a kind of fate the best I can make of it. I am a lifelong reader who spent a great deal of time in libraries and secondhand bookstores growing up -- my first job that wasn’t babysitting was as a library page shelving books at our regional library, and then I went to the University of Virginia where I studied English Literature and archaeology and would often pass Edgar Allan Poe’s former dorm room on the Commons (it has a clear plexiglass covering the entrance so one can always gaze in), and I also took a lot of impromptu detours to UVa’s Special Collections for exhibits and I knew vaguely of the Rare Book School and its offerings. I was always intrigued by book history. And I have always been one of those readers who brought home more than I could ever keep up with, and after graduating I worked in bookshops on and off. For the past 10 years I’ve made a modest living as a freelance writer and arts journalist, and adjunct professor -- and the articles and essays I published were often about literary history, book reviews, or people who had made their life about books. I was not a collector of more than paperbacks except for an occasional lucky find here and there from bookstore shelves. That changed a tiny bit when I met Heather O’Donnell, owner of Honey & Wax Booksellers. I’ve always had side jobs as a writer, as most writers must do, and I was working at Brooklyn’s Community Bookstore as their publicist when we became friends. She was launching her business and starting an annual holiday book fair in Brooklyn -- I volunteered to help her get the word out about it, and I bought some affordable books from her. Her first catalog was inspiring, and I coveted everything she put in it. And not long after Community Bookstore opened a secondhand bookshop nearby called Terrace Books and they soon started offering some rare books as well. I was pretty much completely jealous is what I am trying to say. I was inspired and wanted in. I started going to fairs to see Heather, and pretty quickly became interested in the entire enterprise. The first time I thought I might have a knack for finding and selling rare books was at one of these fairs, I accidentally hand-sold a $6,000 multi-volume copy of “Tristram Shandy” offered by Adams’ Antiquarian Book Shop, to an acquaintance (I think that’s what it was marked, anyway.). I had opened the lovely set to see the blacked out page and the stunning marbled page pasted in, and showed them off, telling this new acquaintance about how it was considered a forerunner to modernism and the postmodern novel, way back in the mid-18th century. And I mentioned how I had visited his home in England, which is open to the public and is a completely great and surreal experience. And then I put the books down and went on my way through the fair and found out later she had bought them. Just like that. And I honestly felt incredible, it was a huge rush. I couldn’t fathom it. Later the Adamses wrote me offering me a small set of an early but later edition of Shandy for a significant discount, I think as a bit of a thank you, and I bought it for myself despite not being really able to afford them. So they are a part of my very small personal collection of books I probably wouldn’t ever sell. I love Tristram Shandy and that marbled and blacked out page so much. When did you open The Second Shelf and what do you specialize in? Books and manuscripts by women, or about women, as well as objects and ephemera that highlight women’s work and contributions to cultural history. I think it was at the same fair with the Shandy where I noticed that modern first editions by women I consider to be extraordinary writers seemed to cost far less than their male contemporaries. Not in all cases, but it seemed to me the majority of them. And I had noticed the fairs are largely attended by male dealers and male collectors, and though I speak broadly, and know plenty of women who deal and collect, I was frankly bothered by it. It didn’t feel like the most inviting place for women -- the fairs often don’t. And there is a diversity issue in the rare book trade that I am also bothered by. For a trade so geared to identifying rare and great work by the most forward-thinking people in history and investing so heavily in the ideas of great writers and artists and book binders and publishers, it can sometimes feel decidedly unprogressive. Part of that is history’s fault -- part of that is the nature of dealing in books from the past. But then, I would argue there is a reason to hunt for what might be overlooked, and certainly no reason to continue to ignore or dismiss certain books or writers now as “uncollectible.” I’m told all the time certain titles by certain women are unsellable. I don’t believe it or buy it at all. And if it’s true now I’m going to work to change that by being a great saleswoman. It’s easy to go to bat for work I believe in. I ran the idea for a book business that was focused on women to Heather and other friends in the book world, and they were all so supportive and encouraging, that I eventually became brave enough to decide to learn the trade. It helped that I was moving to London, a city that is very good for finding books. I am not the only dealer who has focused their company on women, but I might be the first one to say that even the phrase “women’s interest” is problematic. We are not a niche. But we have been treated as one and left out or overlooked in the field, just as women have been in most fields, and so I am determined to raise awareness about this and also hoping to inspire and entice more women to collect -- since men historically tend to be less interested in books by women and since the rare books world does help build a market for writers’ legacies and their archives. I’d like women’s work to be equally valued and as collected and that is starting to happen, as institutions begin to redress the inequality of their shelves, and that means “women’s interest” is actually a good business to be in -- although the valuation of 20th-century women writers is not what I think it should be. I am inspired by the work of book collector and activist Lisa Unger Baskin, who has built an extraordinary collection of books and material relating to women’s work and donated it to Duke’s Rubenstein Library. She says about her collection, “The unifying thread is that women have always been productive and working people and this history essentially has been hidden.” I believe wholeheartedly in this statement and her focus and purpose on documenting this history. My hope for The Second Shelf is to focus significantly on women writers, particularly modern and contemporary writers, in order to provide an affordable access point for readers to become collectors, and therefore stewards of these writers. It also means as a new company operating on a small budget I have been able to build my stock as I learn the trade without taking huge gambles on wildly expensive books, although I have done that a little bit. I am also not limiting myself. I will procure books of importance to women’s history and literature from all eras, as my business’s growth allows. The first book featured in my catalog is a beautiful book bound by a preeminent Norwegian binder -- a significant novel by the first woman to win the Nobel Prize for Literature, and she is a writer I had never heard of until I bought it. I consider my ignorance of her an example of the problem I am trying to address. I should know her name. We all should. It’s Selma Lagerlöf. I love the books. I love the book fiends. And I love showing books to people in person. I might not love aspects of book fairs, but I still love book fairs. I am a visual person and I am a tactile person. Nothing beats shopping and looking at books with your own eyes or handling them yourself. It’s a pretty great job to get to sell people on books you love, and I have all that background from my time in bookstores forcing copies of I Capture the Castle and The Secret History into new readers hands to draw on. It’s a natural job for me. I wake up and hang out with my son and take him to nursery school and try to get working by 10 am. I usually have something due unrelated to the book trade as a freelance writer. I am also finishing my first book any day now. My plate is full. Last year I spent a lot of time in local bookshops turning their stock upside-down. I would sometimes go straight to the stores and then come home and put my books down and then start writing. Then toward the end of the workday I’m a mom again. It’s usually a juggle between writing and loitering in bookstores where I feel guilty about doing one of the other and can feel fairly frantic. I went about things pretty upside-down. I started selling books by men at a monthly fair because I needed practice and to start dealing, and didn’t want to sell my first The Second Shelf stock before I had my first catalog. I was determined to do things a certain way, however untraditional. But what my decisions have afforded me is a rapid introduction and education, so although I’ve started with a bit of a mess, I am quickly in the process of tidying that mess up and when I put up my website, I will have about 500 books cataloged to share, and that’s really only a fraction of what’s in the basement. I won Sylvia Plath’s blue and green tartan skirt recently at auction and I don’t know what to do with myself about it. It has her name on the waistband. I brought it home and discovered it fit me, which was an incredible surprise. I am so in love with it that I wore it out once to dinner before the weather changed in London in case I never got the chance again. I bought it to sell, and certainly can’t afford to keep it, but of all the things I have I am uncomfortable with parting with it -- the thought gives me little pleasure right now, though that could change. I consider it a talismanic object in my life. It led me to commission a poem about it called “How to Wear It” by one of my favorite poets, Ariana Reines, and that will be a broadside published by The Second Shelf printed by Hurst Street Press, a woman-owned letterpress in London. I am letting the skirt be my guide about what to do with it. It’s odds and ends representing highlights of my favorite books and writers. I have some first edition children’s books that I love. I am a huge fan of Susan Cooper and I am one book away from having all the first editions in The Dark is Rising series. I have some Edward Gorey, including one of his fur coats, and signed first editions of my favorite contemporary fiction, but I don’t seek out those books particularly deliberately. The book I most wanted to have for myself was Plath’s The Bell Jar, which she first published under the pseudonym Victoria Lucas. I bought a rather tatty copy and it was relatively affordable and I will never let it go. I don’t need it to be pristine. I like a loved book, this copy was loved by someone named Diane. I have a few books that were owned by John Cheever that are also close to my heart despite being in not great shape, and I have his jazz records. It’s a long story why. I have some nice editions of Poe, a carte de visite, and a brick from his house that was partially demolished by NYU to make more student housing -- the Poe stuff is the result of minor fixation on him, and an unfinished book I researched for five years. I have a plastic jar of water from Flannery O’Connor’s pond -- it’s slowly evaporating. I love books. But I also love objects that have unique associations with the writers whose books I love. I love to travel, particularly by train. My first book is actually called Train comes out next year from Bloomsbury and it is about a 30-day solo train trip I took circumnavigating America. I like visiting dead authors’ houses that are open to the public. And I hang out with my family and I have a narrowboat on Regent’s canal that is both a pleasure and an endless supply of problems to solve. I read books, obviously, like, a lot of them. I am running a Kickstarter campaign right now to bring awareness to the historic inequality of the book trade and on bookshelves and to find supporters for my business, and the tagline of it is, “The Future of Books is Female.” I repurposed “The Future is Female” motto that has become current again and that originated from Labyris Books, a 1970s feminist bookshop in New York. I also have a statement on my website about my definition of women being open and expansive. The Second Shelf is intersectional in its stock and perspective. I don’t think the book trade will survive without women collectors and dealers being treated equally for their work and contributions or being treated as niche, so I’m doubling down on it, even as I specialize specifically in books by women. I feel the same about the trade’s need to diversify. The trade is too white. I am offering a scholarship for a woman to attend York Antiquarian Book Seminar. And Jonathan Kearns Rare Books is offering a scholarship for a person of color to attend. The future of the book trade looks bright ... if it figures out how to become more inclusive. It’s not there yet, it’s feeling a bit dusty at the moment. I am exhibiting in my first PBFA fair this weekend in London and my first fair list will go out right before. My first catalog has become a bit of a different beast. I’ve commissioned some incredible writers to write about some of their favorite writers that I have in my stock, and now the catalog is something rather different. It’s called The Second Shelf: A Quarterly of Rare Books and Words by Women. It’s available only through the Kickstarter for now or by single issue or subscription and will ship in June or early July. Clients who have bought from me in the past will be given issues, but otherwise, it’s available for purchase. The books will be available to the trade through lists and online when I launch the online website later this year. I consider this business based on both sides of the pond and so I am glad to attend the Brooklyn Antiquarian Book Fair in September. It's been a series of convergences that now seem like a kind of fate the best I can make of it. I am a lifelong reader who spent a great deal of time in libraries and secondhand bookstores growing up -- my first job that wasn't babysitting was as a library page shelving books at our regional library, and then I went to the University of Virginia where I studied English Literature and archaeology and would often pass Edgar Allan Poe's former dorm room on the Commons (it has a clear plexiglass covering the entrance so one can always gaze in), and I also took a lot of impromptu detours to UVa's Special Collections for exhibits and I knew vaguely of the Rare Book School and its offerings. I was always intrigued by book history. And I have always been one of those readers who brought home more than I could ever keep up with, and after graduating I worked in bookshops on and off. For the past 10 years I've made a modest living as a freelance writer and arts journalist, and adjunct professor -- and the articles and essays I published were often about literary history, book reviews, or people who had made their life about books. I was not a collector of more than paperbacks except for an occasional lucky find here and there from bookstore shelves. 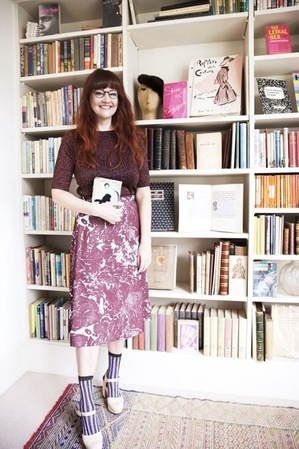 That changed a tiny bit when I met Heather O'Donnell, owner of Honey & Wax Booksellers. I've always had side jobs as a writer, as most writers must do, and I was working at Brooklyn's Community Bookstore as their publicist when we became friends. She was launching her business and starting an annual holiday book fair in Brooklyn -- I volunteered to help her get the word out about it, and I bought some affordable books from her. Her first catalog was inspiring, and I coveted everything she put in it. And not long after Community Bookstore opened a secondhand bookshop nearby called Terrace Books and they soon started offering some rare books as well. I was pretty much completely jealous is what I am trying to say. I was inspired and wanted in. I started going to fairs to see Heather, and pretty quickly became interested in the entire enterprise. The first time I thought I might have a knack for finding and selling rare books was at one of these fairs, I accidentally hand-sold a $6,000 multi-volume copy of "Tristram Shandy" offered by Adams' Antiquarian Book Shop, to an acquaintance (I think that's what it was marked, anyway.). I had opened the lovely set to see the blacked out page and the stunning marbled page pasted in, and showed them off, telling this new acquaintance about how it was considered a forerunner to modernism and the postmodern novel, way back in the mid-18th century. And I mentioned how I had visited his home in England, which is open to the public and is a completely great and surreal experience. And then I put the books down and went on my way through the fair and found out later she had bought them. Just like that. And I honestly felt incredible, it was a huge rush. I couldn't fathom it. Later the Adamses wrote me offering me a small set of an early but later edition of Shandy for a significant discount, I think as a bit of a thank you, and I bought it for myself despite not being really able to afford them. So they are a part of my very small personal collection of books I probably wouldn't ever sell. I love Tristram Shandy and that marbled and blacked out page so much. Books and manuscripts by women, or about women, as well as objects and ephemera that highlight women's work and contributions to cultural history. I think it was at the same fair with the Shandy where I noticed that modern first editions by women I consider to be extraordinary writers seemed to cost far less than their male contemporaries. Not in all cases, but it seemed to me the majority of them. And I had noticed the fairs are largely attended by male dealers and male collectors, and though I speak broadly, and know plenty of women who deal and collect, I was frankly bothered by it. It didn't feel like the most inviting place for women -- the fairs often don't. And there is a diversity issue in the rare book trade that I am also bothered by. For a trade so geared to identifying rare and great work by the most forward-thinking people in history and investing so heavily in the ideas of great writers and artists and book binders and publishers, it can sometimes feel decidedly unprogressive. Part of that is history's fault -- part of that is the nature of dealing in books from the past. But then, I would argue there is a reason to hunt for what might be overlooked, and certainly no reason to continue to ignore or dismiss certain books or writers now as "uncollectible." I'm told all the time certain titles by certain women are unsellable. I don't believe it or buy it at all. And if it's true now I'm going to work to change that by being a great saleswoman. It's easy to go to bat for work I believe in. I ran the idea for a book business that was focused on women to Heather and other friends in the book world, and they were all so supportive and encouraging, that I eventually became brave enough to decide to learn the trade. It helped that I was moving to London, a city that is very good for finding books. I am not the only dealer who has focused their company on women, but I might be the first one to say that even the phrase "women's interest" is problematic. We are not a niche. But we have been treated as one and left out or overlooked in the field, just as women have been in most fields, and so I am determined to raise awareness about this and also hoping to inspire and entice more women to collect -- since men historically tend to be less interested in books by women and since the rare books world does help build a market for writers' legacies and their archives. I'd like women's work to be equally valued and as collected and that is starting to happen, as institutions begin to redress the inequality of their shelves, and that means "women's interest" is actually a good business to be in -- although the valuation of 20th-century women writers is not what I think it should be. I am inspired by the work of book collector and activist Lisa Unger Baskin, who has built an extraordinary collection of books and material relating to women's work and donated it to Duke's Rubenstein Library. She says about her collection, "The unifying thread is that women have always been productive and working people and this history essentially has been hidden." I believe wholeheartedly in this statement and her focus and purpose on documenting this history. I am also not limiting myself. I will procure books of importance to women's history and literature from all eras, as my business's growth allows. The first book featured in my catalog is a beautiful book bound by a preeminent Norwegian binder -- a significant novel by the first woman to win the Nobel Prize for Literature, and she is a writer I had never heard of until I bought it. I consider my ignorance of her an example of the problem I am trying to address. I should know her name. We all should. It's Selma Lagerlöf. I love the books. I love the book fiends. And I love showing books to people in person. I might not love aspects of book fairs, but I still love book fairs. I am a visual person and I am a tactile person. Nothing beats shopping and looking at books with your own eyes or handling them yourself. It's a pretty great job to get to sell people on books you love, and I have all that background from my time in bookstores forcing copies of I Capture the Castle and The Secret History into new readers hands to draw on. It's a natural job for me. I wake up and hang out with my son and take him to nursery school and try to get working by 10 am. I usually have something due unrelated to the book trade as a freelance writer. I am also finishing my first book any day now. My plate is full. Last year I spent a lot of time in local bookshops turning their stock upside-down. I would sometimes go straight to the stores and then come home and put my books down and then start writing. Then toward the end of the workday I'm a mom again. It's usually a juggle between writing and loitering in bookstores where I feel guilty about doing one of the other and can feel fairly frantic. I went about things pretty upside-down. I started selling books by men at a monthly fair because I needed practice and to start dealing, and didn't want to sell my first The Second Shelf stock before I had my first catalog. I was determined to do things a certain way, however untraditional. But what my decisions have afforded me is a rapid introduction and education, so although I've started with a bit of a mess, I am quickly in the process of tidying that mess up and when I put up my website, I will have about 500 books cataloged to share, and that's really only a fraction of what's in the basement. I won Sylvia Plath's blue and green tartan skirt recently at auction and I don't know what to do with myself about it. It has her name on the waistband. I brought it home and discovered it fit me, which was an incredible surprise. I am so in love with it that I wore it out once to dinner before the weather changed in London in case I never got the chance again. I bought it to sell, and certainly can't afford to keep it, but of all the things I have I am uncomfortable with parting with it -- the thought gives me little pleasure right now, though that could change. I consider it a talismanic object in my life. It led me to commission a poem about it called "How to Wear It" by one of my favorite poets, Ariana Reines, and that will be a broadside published by The Second Shelf printed by Hurst Street Press, a woman-owned letterpress in London. I am letting the skirt be my guide about what to do with it. It's odds and ends representing highlights of my favorite books and writers. I have some first edition children's books that I love. I am a huge fan of Susan Cooper and I am one book away from having all the first editions in The Dark is Rising series. I have some Edward Gorey, including one of his fur coats, and signed first editions of my favorite contemporary fiction, but I don't seek out those books particularly deliberately. The book I most wanted to have for myself was Plath's The Bell Jar, which she first published under the pseudonym Victoria Lucas. I bought a rather tatty copy and it was relatively affordable and I will never let it go. I don't need it to be pristine. I like a loved book, this copy was loved by someone named Diane. I have a few books that were owned by John Cheever that are also close to my heart despite being in not great shape, and I have his jazz records. It's a long story why. I have some nice editions of Poe, a carte de visite, and a brick from his house that was partially demolished by NYU to make more student housing -- the Poe stuff is the result of minor fixation on him, and an unfinished book I researched for five years. I have a plastic jar of water from Flannery O'Connor's pond -- it's slowly evaporating. I love books. But I also love objects that have unique associations with the writers whose books I love. I love to travel, particularly by train. My first book is actually called Train comes out next year from Bloomsbury and it is about a 30-day solo train trip I took circumnavigating America. I like visiting dead authors' houses that are open to the public. And I hang out with my family and I have a narrowboat on Regent's canal that is both a pleasure and an endless supply of problems to solve. I read books, obviously, like, a lot of them. I am running a Kickstarter campaign right now to bring awareness to the historic inequality of the book trade and on bookshelves and to find supporters for my business, and the tagline of it is, "The Future of Books is Female." I repurposed "The Future is Female" motto that has become current again and that originated from Labyris Books, a 1970s feminist bookshop in New York. I also have a statement on my website about my definition of women being open and expansive. The Second Shelf is intersectional in its stock and perspective. I don't think the book trade will survive without women collectors and dealers being treated equally for their work and contributions or being treated as niche, so I'm doubling down on it, even as I specialize specifically in books by women. I feel the same about the trade's need to diversify. The trade is too white. I am offering a scholarship for a woman to attend York Antiquarian Book Seminar. And Jonathan Kearns Rare Books is offering a scholarship for a person of color to attend. The future of the book trade looks bright ... if it figures out how to become more inclusive. It's not there yet, it's feeling a bit dusty at the moment. I am exhibiting in my first PBFA fair this weekend in London and my first fair list will go out right before. My first catalog has become a bit of a different beast. I've commissioned some incredible writers to write about some of their favorite writers that I have in my stock, and now the catalog is something rather different. It's called The Second Shelf: A Quarterly of Rare Books and Words by Women. It's available only through the Kickstarter for now or by single issue or subscription and will ship in June or early July. Clients who have bought from me in the past will be given issues, but otherwise, it's available for purchase. The books will be available to the trade through lists and online when I launch the online website later this year. I consider this business based on both sides of the pond and so I am glad to attend the Brooklyn Antiquarian Book Fair in September.